The Saudi Health Interview Survey (SHIS) was conducted in 2013. Data were collected through interviews and anthropometric measurements were done. A diet history questionnaire was used to determine the amount of consumption for eighteen food or beverage items in a typical week. The study was a household survey in all thirteen administrative regions of Saudi Arabia. Participants were 10 735 individuals aged 15 years or older. Mean daily consumption was 70·9 (SE 1·3) g for fruits, 111·1 (SE 2·0) g for vegetables, 11·6 (SE 0·3) g for dark fish, 13·8 (SE 0·3) g for other fish, 44·2 (SE 0·7) g for red meat, 4·8 (SE 0·2) g for processed meat, 10·9 (SE 0·3) g for nuts, 219·4 (SE 5·1) ml for milk and 115·5 (SE 2·6) ml for sugar-sweetened beverages. Dietary guideline recommendations were met by only 5·2 % of individuals for fruits, 7·5 % for vegetables, 31·4 % for nuts and 44·7 % for fish. The consumption of processed foods and sugar-sweetened beverages was high in young adults. 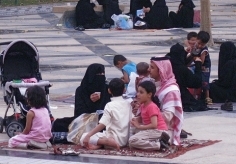 Only a small percentage of the Saudi population met the dietary recommendations. Programmes to improve dietary behaviours are urgently needed to reduce the current and future burden of disease. The promotion of healthy diets should target both the general population and specific high-risk groups. Regular assessments of dietary status are needed to monitor trends and inform interventions.